Singapore Technologies Kinetics is highlighting at the Singapore Airshow two unmanned ground vehicle systems (UGV) demonstrating robotics applications of combat systems - the Israeli Amstaff and Estonian TheMIS. 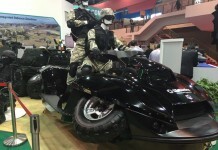 The Israeli Amstaff robotic vehicle from Automotive Robotic Industries is making its debut at the Singapore Airshow , carrying ST Kinetics’ remotely controlled weapon system. Photo: Noam Eshel, defense-Update. 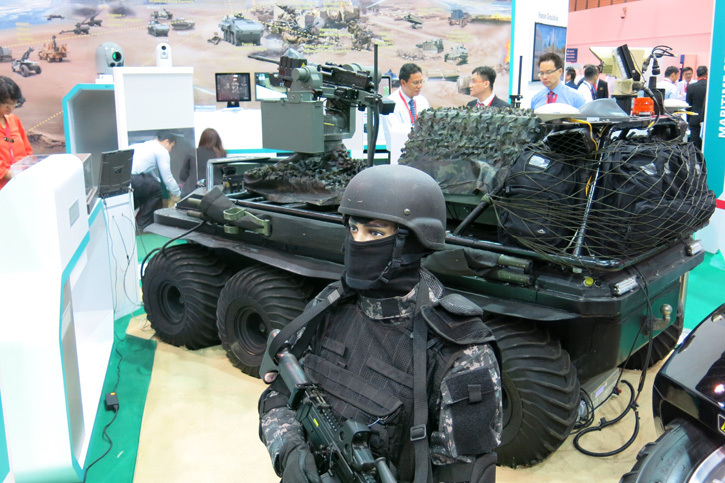 Singapore Technologies Kinetics (STK) is highlighting at the Singapore Airshow two unmanned ground vehicle systems (UGV) demonstrating robotics applications of combat systems. 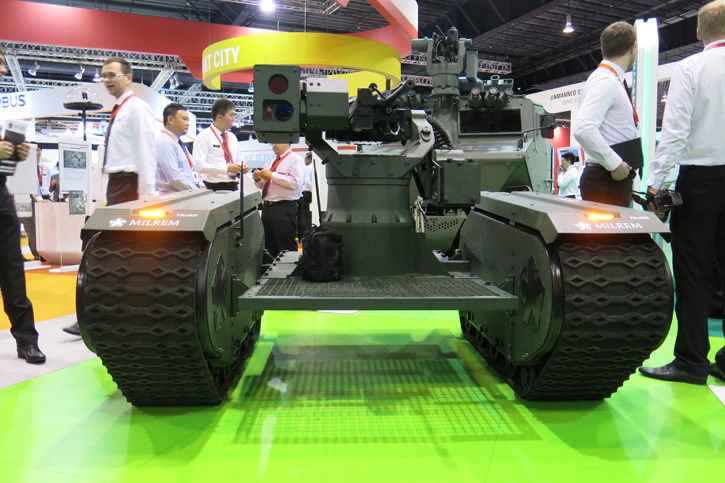 The two platforms selected by STK are the Amstaf Israeli wheeled UGV from Automotive Robotic Industries and the TheMIS tracked UGV from Milrem of Estonia, Both debut a Singapore Airshow carrying ST Kinetics’ remotely controlled weapon systems. 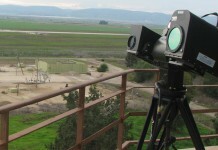 Amstaf has already proved its operational use, guarding villages, military facilities and infrastructure site sin operational use and field evaluations in Israel, South Korea, Poland and Canada and other locations worldwide. 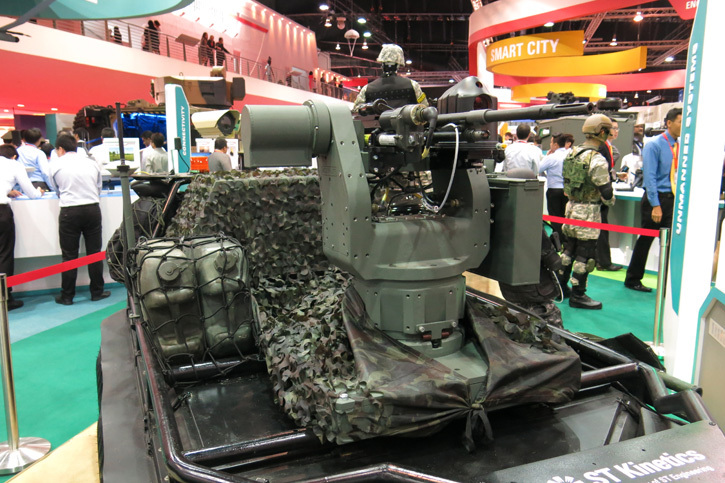 The configuration used by Singapore Technologies include both 6×6 and 8×8 electrically powered vehicles dubbed ‘Jaeger UGV’. It is equipped with diesel engine and charger alternator that keeps battery full at all time, supporting up to 48 hours of autonomy. When silent operation is mandatory the vehicle can endure over 6 hours on battery power only, quick charging enables the robot to top-up its battery from the on-board charger in 3 hours. The second platform on display is the Tracked Hybrid Modular Infantry System (THeMIS) from Milrem UGV. 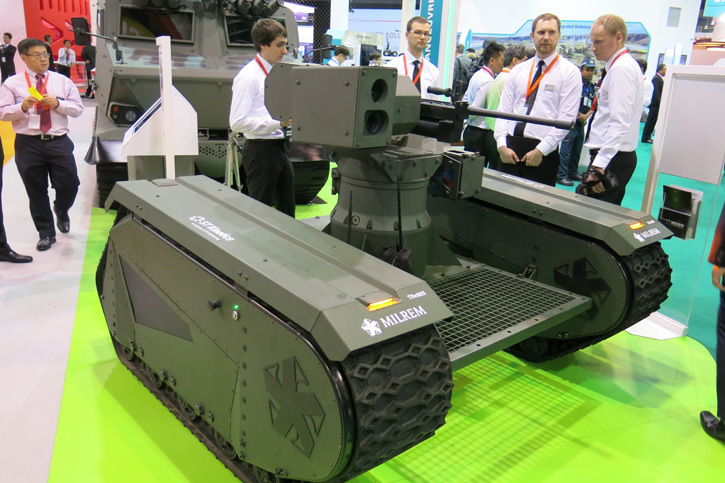 TheMIS ADDER (a variant where UGV THeMIS and RWS ADDER are integrated) is a weaponized unmanned ground vehicle equipped with a remote weapon station. 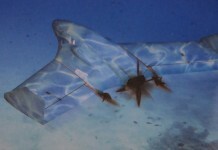 The vehicle has independent, electrically powered propulsion units embedded in each track. 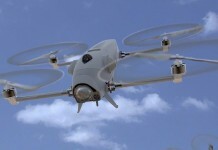 The TheMIS development has been funded by the Estonian Ministry of Defence. 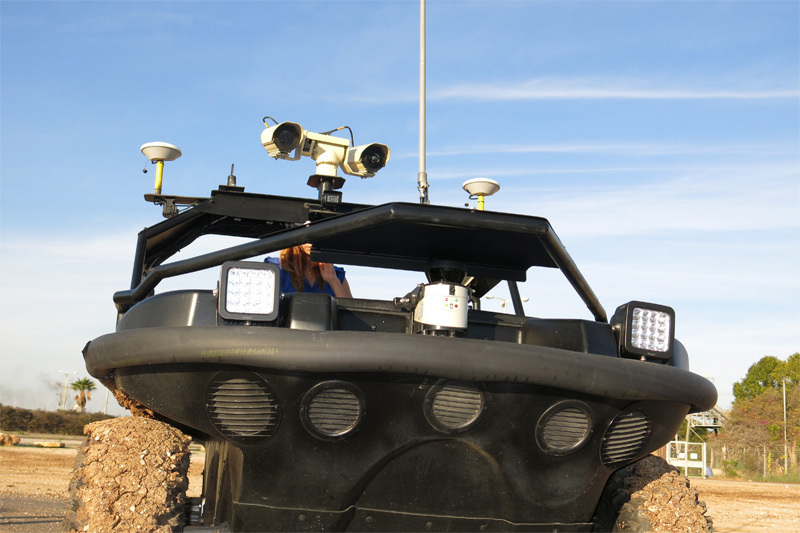 The prototype of the UGV was unveiled at DSEI 2015 in London, UK last autumn. TheMIS ADDER – forward view. The platform can be expanded, in width and length, to fit specific payloads and mission systems. Photo: Tamir Eshel, Defense-Update. Its kerb weight is 750-850 kg and maximum speed is 25-35 km/h. The platform can carry its own weight (750kg) as payload, bringing the total gross weight to more than 1.5 tons; yet the wide tracks maintain the ground pressure as low as 0.069 kg/cm2, maintaining high off-road maneuverable and amphibious capability with high mobility in mud, sand, water and snow. 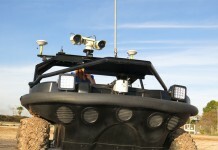 The vehicle can be remotely controlled by an operator, or follow the operator from a safe distance, while maneuvering to avoid obstacles. 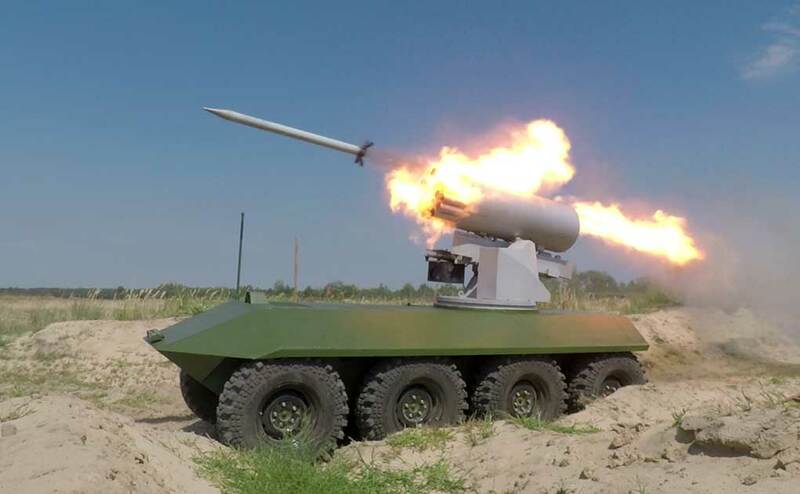 In addition to the use as a mobile, remotely operated weapon or anti-tank missile carrier, TheMIS can also assume other missions such as combat casualties evacuation, firefighting, demining, CBRN reconnaissance, combat support supply ‘mule’.